I remember when I first heard that a Sommelier, a good Sommelier, I mean a really good one, could decipher not only varietal and region, but even vineyard source and vintage in a blind tasting. It blew my mind. It still blows my mind. The fact that any person can know that much about wine or about anything for that matter, is impressive to say the least. As time went on and I was exposed to more wine (and better wine), I began to comprehend how someone could accomplish such as task. While I am many long pours away from picking out a vineyard designate 1997 Burgundy from a group of Pinots from around the World, I have learned to start picking our distinct differences in California wines. The more I drink the more I am trained to recognize characteristics common to varietals and regions from all over the state. This is the spirit behind our new monthly look at the regions of California, to explore more in-depth a handful of regions that most interest us. I will not seek to judge or label, merely to present a list of what we explored over a month and what I liked best. And so, a bit late, I offer January – Sta. Rita Hills and the Santa Maria Valley. It was the whites that shone brightest this month. Even with a unusually truncated schedule, we sampled a nice selection of wines from a diverse backgrounds and styles. Pinot Noir from both regions (even an $8 Pinot from Trader Joes) and a delicious cool climate Syrah from the Bien Nacido Vineyard. On the white side, we compared two Rieslings from Kick-On Ranch located between Sta. Rita Hills and Santa Maria Valley, as well as Chardonnay from both regions and a delightful Pinot Gris from a legend of the Sta. Rita Hills. On the red side, it was a toss-up between a legend of the area and one of its fastest rising stars. Adam Tolmach’s 2005 Bien Nacido Syrah is a mysterious and formidable cool climate Syrah with intense nose and color concentration. Some don’t care for cooler climate Syrah, I love them and there is no doubt Adam is a master of Syrah. In a similar way, Chad Melville is quickly rising to fame for is powerful but refined Pinot and Chardonnays. 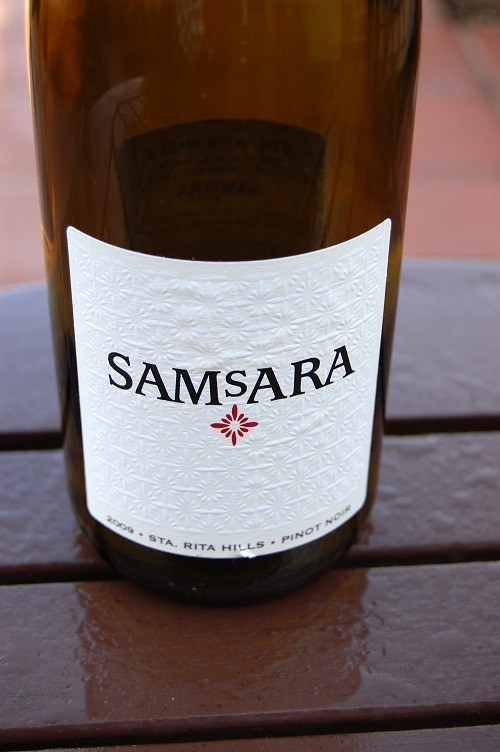 Under the SAMsARA label his 2009 Sta . Rita Hills Pinot Noir offers an equally beautiful and intense experience. These two wines scored almost identically for me, but in the end, at $30 to Ojai’s $40 Syrah, I was pleased with SAMsARA’s price point. This is a red that I think will stack up well against other reds in the coming months. It was the whites I enjoyed most in January (where we had unseasonable warmth). Again, Adam knocked it out of the park with his 2008′ Kick On Ranch Riesling, a wine I got to taste with Mr. Tolmach before its release. 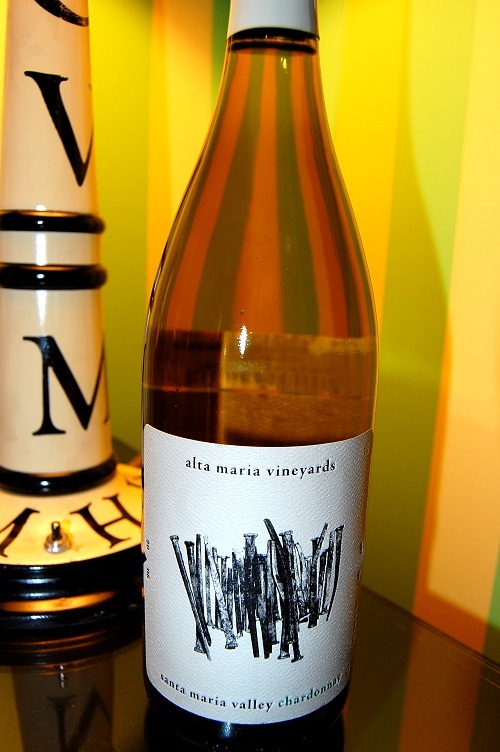 I also loved the Alta Maria Chardonnay, a white I go to regularly with its bright clear fruit and reasonable $25 price. 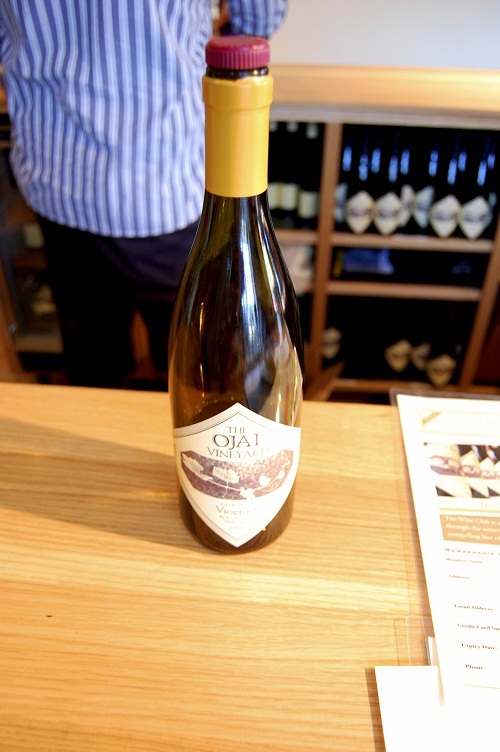 In the end, two wines stood out, sourced from vineyards only a couple miles apart. 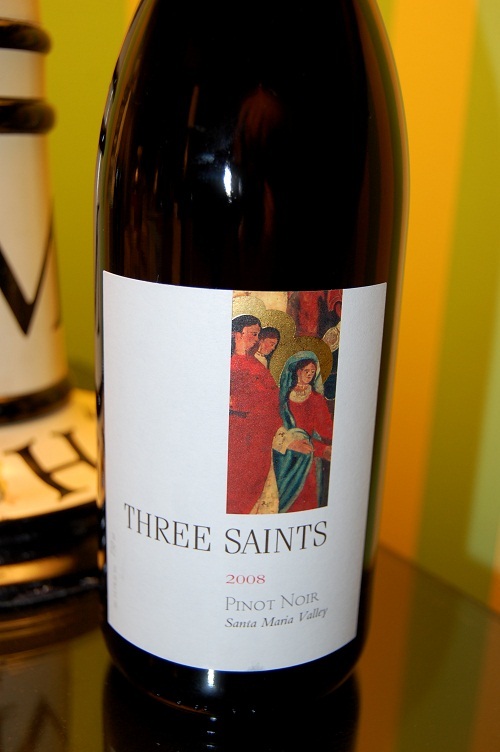 Wes Hagen has been crafting some of the most interesting Burgundies from his Sta. 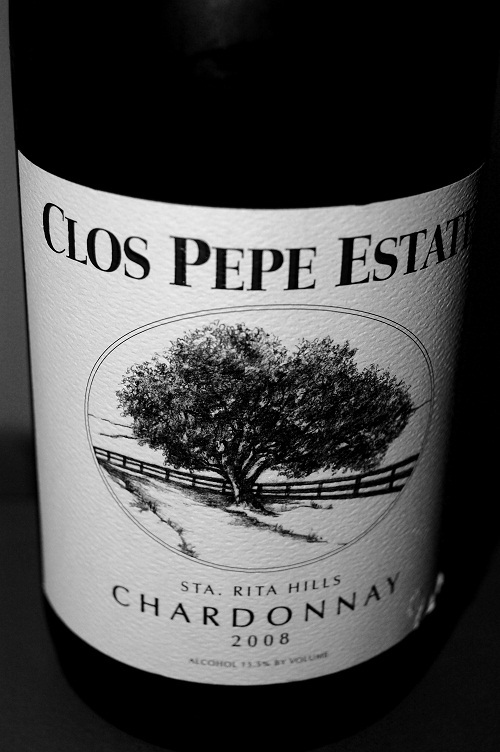 Rita Hills Clos Pepe Estate Vineyard. He is a devotee to the region (his blood runs Pinot red with some Lakers purple and gold too) and to wines that pair well with food. No monster over-oaked wines to be found here. He is a Randal Grahm of the south, long hair and all. He is someone to watch if you like food friendly wines and his 2007 Chardonnay made in a Chablis style was a great food companion to some spicy Asian noodles. Bright, crisp, with wonderful acid and a great mouth feel that left you wanting more for more. But unlike our reds, where an up and coming star edged out a long time legend, in the whites it was another legend that came out on top. Richard Sanford’s 2007 Alma Rosa La Encantada Vineyard Pinot Gris has everything I want in a cool climate California white. Possessing many of the qualities I love is Wes’ Chardonnay, I had a hard time putting this bottle down, in fact, we didn’t until it was gone! 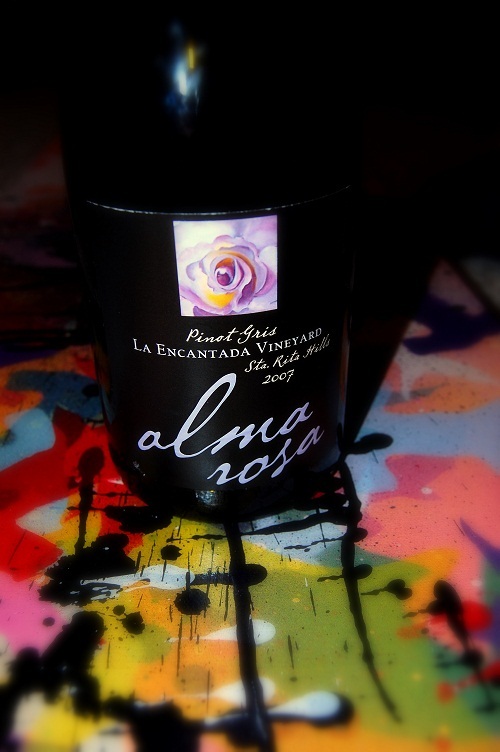 Richard Sanford has certainly made a name with his championing of Pinot Noir in Santa Barbara County, but Alma Rosa’s whites (especially their Pinot Blanc) are a true joy to drink and the 07’ Pinot Gris was no exception. So congratulations to SAMsARA and Alma Rosa as they advance to represent the Southern Regions in the months to come. On to February and to greater Santa Barbara County including Santa Ynez Valley and Happy Canyon. Thanks for the list. I will certainly be checking a few of these out.